Christmas is only a few sleeps away – can you believe it?! I sure can’t, and time has been moving even quicker than normal since we’ve been working on Mom’s Lake House. The kitchen in their beautiful lake home is almost complete (you can see the mood board for that here), and I can’t wait to share it with you. Meanwhile, I had the chance to decorate their newly finished master bedroom for the Holiday season in traditional reds and greens. A couple of new key pieces from The Brick helped take their room for light and airy to soft and cozy just in time for Christmas. 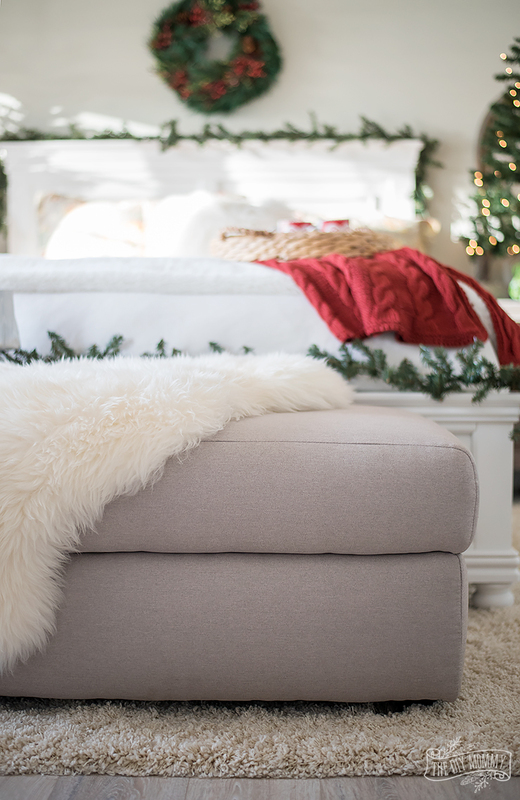 Come take a tour and get some traditional Christmas bedroom decorating ideas! Here’s how the room looked last month when we finished it for the Fall One Room Challenge. You can read more about all of that right here. It’s an airy look with lots of monochromatic colours. 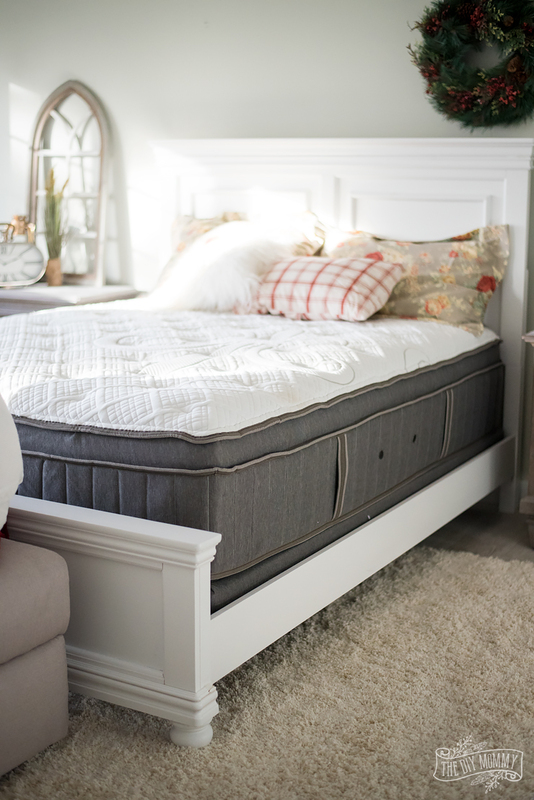 The first thing we did to get it ready for Christmas was add an amazing new mattress set to the bed from The Brick – the Stearns & Foster Marina Bay Euro-Top Plush Low-Profile Queen Mattress Set. My parents spent a long time looking for the perfect mattress for their new home, and this one was at the very top of their list. It’s plush with gel memory foam, but features supportive pocket coils underneath. It’s the perfect blend of soft and supportive! We used the same floral shams that my mom made, but we made the red accents in the shams really pop with a whole lot of festive, red accessories like a handmade red plaid pillow & coverlet and a red knit blanket. I also dressed the Bridgeport Queen Bed from The Brick for the Holidays with a faux green garland on its headboard and footboard. You can never have enough greenery at Christmas time in my opinion, and I think it looks especially good in this room with the soft grey-green walls. 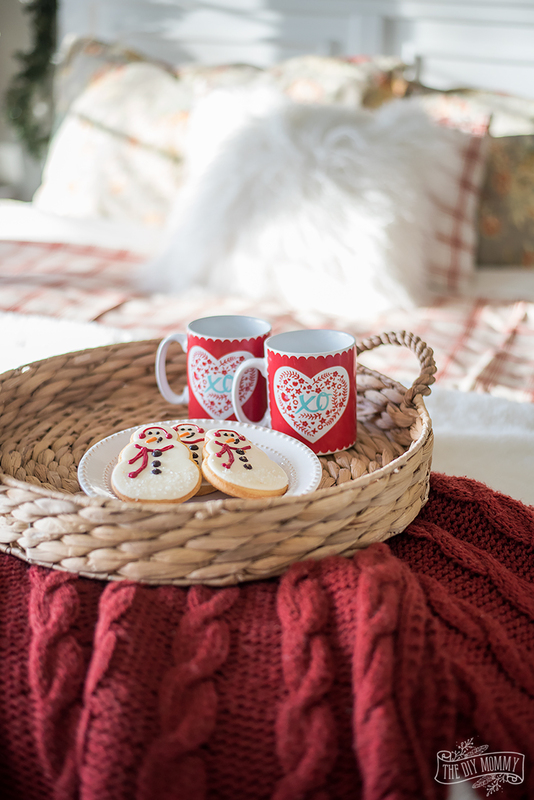 A wicker tray all setup with cookies and mugs looks like it’s ready to enjoy on Christmas morning. At the foot of the bed is another new item that we’ve been looking forward to receiving – this extra large Designed2B Fabric Rectangular Storage Accent Ottoman from The Brick. Did you know that you can order custom upholstered pieces from The Brick? We wanted a matching ottoman and chairs pair for this room, and we loved this “Sophisticate Fog” colour – it’s a wonderful neutral. Not only does this ottoman offer extra seating at the end of the bed, but the top lifts open for extra storage for blankets and pillows during the cold winter months. We ordered a pair of these beautiful swivel chairs in the same fabric – the Designed2B Fabric Accent Swivel Chairs – and they’re the perfect pieces for either having a morning cup of coffee or gazing out at the lake. I really like the scale of these chairs for this room; they fill it up nicely. If you head to The Brick in store, you can see all of the Designed2B furniture options as well as the custom fabric swatches you can choose to make them your own. It’s a great option if you’re looking for custom looking furniture shapes and colours for your home! 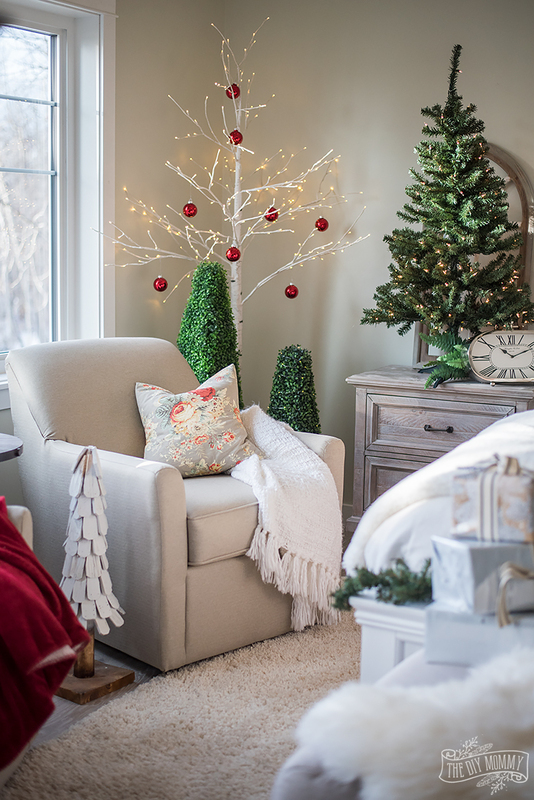 A lit faux birch tree in the corner decorated with red Christmas ornaments and some tabletop trees on the nightstands help give this room even more traditional Holiday appeal. I also dressed the matching chairs in DIY pillows and throw blankets to make them look extra cozy. I really love how different this room looks with the addition of reds and greenery, and I hope my parents will get a chance to enjoy it even though the rest of their house isn’t quite done yet! Never underestimate the power of a few coloured textiles like blankets and pillows along with fresh or faux greenery – they’re inexpensive touches that can make a huge difference. 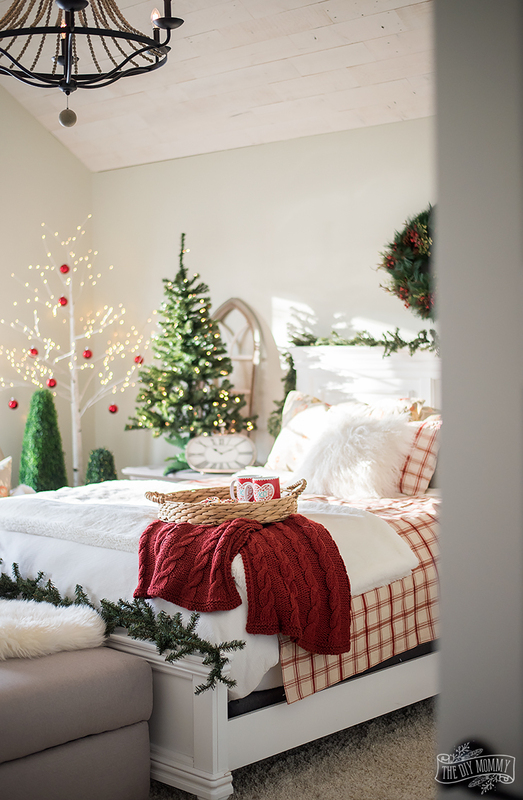 What do you think of this traditional Christmas bedroom look? Thank you DIY Mom for your good wishes and i hope you and your family have a brilliant 2018. I made wreaths for the first time this year but was disappointed I didn’t sell any on Etsy. I will persevere and hopefully do better this year. Take care. Thank you, Susan! The best to you are your family in 2018. I love these decor ideas! Traditional decor is always going to be beautiful. Thanks for sharing these ideas! Theses festive bedrooms really make me feel like I want to have them all year round. Great ideas Christine, hope you do more of these! Such great and innovative ideas for the festive decorations. Love your pictures. Really tells the stories. Sharon recently posted..Attention Watch Lovers – Get spoiled with perfect gifts & accessories!